CAIRO - Former Egyptian President Hosni Mubarak could be released from prison as early as Thursday after a Cairo court today ordered his release. But even if he walks out of Cairo's Tora prison, he will be placed under house arrest. In a statement Wednesday night, Prime Minister Hazem el-Beblawi ordered the house arrest as part of the emergency laws put in place last month. The former dictator will also be barred from leaving the country under a previously issued travel ban and unable to access his foreign assets. 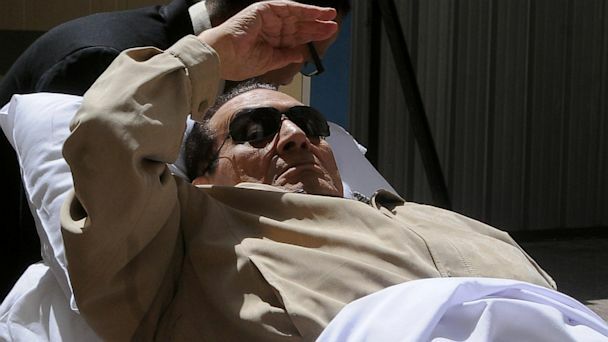 "The court decided to release him," Mubarak's longtime lawyer, Fareed el-Deeb, told Reuters after today's court session. Asked when, he said, "Maybe tomorrow." Egypt's state newspaper, Al Ahram, quoted an unnamed judicial source today who said his release could come as soon as tonight. Judicial sources confirmed to ABC News that the court had upheld a petition from Deeb that called for the release of the former dictator. The public prosecutor's office is not expected to appeal the decision. Deeb's prediction earlier this week that his client would be released within days was met with doubt. "All we have left is a simple administrative procedure that should take no more than 48 hours," Deeb told Reuters Monday. "He should be freed by the end of the week." Deeb appears to have been right. Cairo's Criminal Court Monday cleared Mubarak, 85, of an outstanding corruption charge related to illegal gifts he received while in office. The former dictator has been behind bars since April 2011 on a lengthy list of charges. Mubarak was sentenced last summer to life in prison for his failure to stop the killing of hundreds of civilians during the 18-day revolution of 2011. After appealing the decision in January, Egypt's highest appeals court ordered a retrial. Today's news comes as Egypt reels from the ouster of its second president in two years, Mohamed Morsi, who was elected last year to replace Mubarak. After the deadliest week in the country's modern history, the reappearance of the embattled dictator threatens to inflame political tensions. More than 1,000 people have reportedly been killed since last Wednesday. The announcement of Mubarak's release enraged Islamists. During Morsi's presidency, the Muslim Brotherhood was keen to keep Mubarak locked up. In the wake of the July 3 military takeover that removed the Brotherhood from power, his release will likely bolster the Islamists' claims that the old regime is making a comeback. Many of the new government's leaders also served under Mubarak. Egypt's army chief, Gen. Abdel Fattah el-Sissi, was Mubarak's head of intelligence and the interim president, Adly Mansour, was recently promoted by Mubarak. But the Islamists are not alone. Mubarak's release deals a dramatic blow to all supporters of the 2011 revolution. "It'll cancel everything we did for the past year, the past two years," an Egyptian man in Cairo's Zamalek neighborhood told ABC News today. "It'll cancel everything we've been through - all the killing, all the bloodshed - it's devastating." He added, "I'm expecting a second revolution for that." Meanwhile, two more senior Muslim Brotherhood leaders were arrested earlier today.